Suzy Cue Australia Pty. Ltd .
a prompter system for Conferences & Awards? Our Conference Displays are usually used in sets of two, one for each side of the lectern. They are housed in discreet black boxes and our operators both run and tape the cabling where required. The prompters work best when placed on the stage, in front and on either side of the lectern - about 1 - 1.5 metres away. If they are too far below the stage level, the poles must be extended higher and the size and brightness of the text (as reflected in the mirrors) is reduced. Please take this into account when positioning and lighting the lectern. If there is no room on the stage for the prompters, an additional riser or some dressed road cases can be of great help. It is also desirable to avoid stage lighting spilling onto the prompter displays, as it reduces the brightness and contrast of the words and the reflections can be off-putting to speakers. Note also that the prompter displays are designed to work in darkened rooms; venues with a lot of daylight or bright lighting in the presenter's line-of-sight can reduce their effectiveness. If this is a probablility, please advise at the time of booking so we can provide a HiBright LED screen system for such venues. While a position which provides line-of-sight can be helpful, it is certainly not necessary. But we do need to be able to hear the speakers clearly. Please take this into account when scheduling rehearsals for times when audio personnel may not be available. We operate from laptop computers so we only need a small amount of table space. Sitting near the show director can be helpful for revising scripts during rehearsals, and can limit the need for a talkback headset. We provide and run vision cables between the Cueword computer and the Conference Display units. When a venue is particularly large and the operator is positioned some distance away, it can be helpful if patch bays are available or an extra cable can be run when the main AV crew set up. We can take several vision feeds from the Cueword computer, as well as loop through the prompter displays, so additional feeds can be provided for other monitors. We would be happy to work direct with your AV supplier to arrange the best solution for your event. If you are going to use large plasma displays or floor monitors in addition to or instead of On-Stage Conference Displays, we can easily provide vision feeds for them. Try to place them some distance from where the presenters will be, to allow for viewing from a variety of stage positions. Common placements include at the back of the room, in the middle of the audience (with the audio/lighting desk) or at the base or edge of stage. 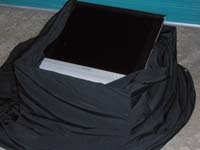 Our 22" stage floor monitors resemble fold back speaker wedges so can easily be disguised on the front of stage. Perfect for the vocalists trying to recall song lyrics.